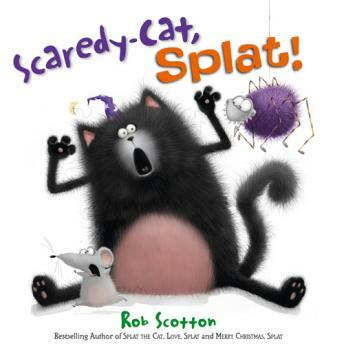 It's Halloween and Splat is determined to be the scariest cat in the class. Unfortunately he's just too much of a scaredy-cat. He's afraid of a little spider, and everyone says his costume looks more silly than scary. And when the teacher tells a ghost story in the dark, Splat gets so frightened that he tips over his pumpkin jack-o-lantern. But when the lights go back on, the entire class is scared silly by a small, black furry creature with a big pumpkin head. Whoooo could it be?